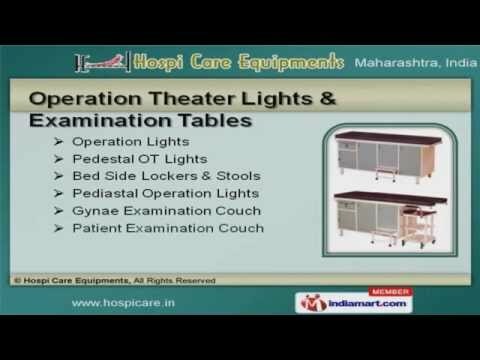 Welcome to Hospi Care EquipmentsManufacturer & Supplier of Hospital Equipment and FurnitureThe company was incepted in 1997, at Nashik. Our Skilled R&D department, Qualified& diligent workforce make us unique in the industry. NDMVP Medical College & Suvichar Hospital are some of our prestigious clients andwe are backed by Customized solutions & Industry leading prices. We offer a vast range of ICU, Hospital & Ward Care Beds. Our ICU, Hospital & Ward Care Beds are well known for their durability. Operation Theater Lights & Examination Tables offered by us are best in the industryamongst others. Our Hospital & Ward Care Furniture are in huge demand across the global markets. We also provide Stretcher & Hospital Trolleys that are nothing but the best solution forall your needs. Along with that we offer Hospital Tables, Examination Couches & Ward CareAttachments that are a class apart.